Pulco, a French drink brand owned by Orangina Schweppes, is a default summer drink. (Because when else would you have a cool citrus-lemon beverage?) And amid an epic heat wave recently, it capitalized on that positioning with #LaParesseADuBon. Roughly translated to "Laziness can be good," it encouraged people to relax and go slow—because what else is there to do when you see mirages while crossing the street? Earlier this month, with help from agency Fred & Farid, it illustrated that premise by taking seven days to finish posting a single-line Facebook status update. The post unfolded word by word, and eventually read, "It's too hot to work." While it didn't capture much attention outside the ad industry (which fawns over itself in France just as much as it does in the U.S.), this is a nice example of how creative can manipulate the mechanics of social platforms to produce something unique and playful—and which, in this case, loyally manifests the brand's message. It's also a tribute to Pulco that it let an incomplete sentence stand for a week without freaking out. 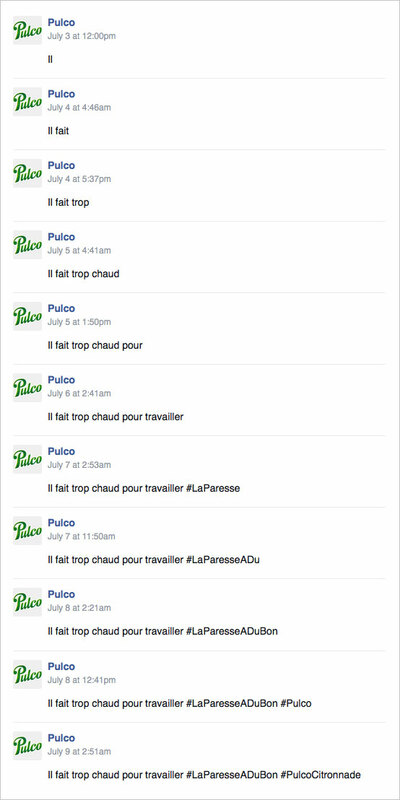 It doesn't look like Pulco spends much, media buy-wise, but the post scored at least twice as many likes as any number of its painstaking but minimalist image posts. It won't win Lions or anything, but it's evidence that while engagement might be low, the brand is willing to experiment and be a bit scrappy. Seven days is apparently also a record for the longest amount of time it's taken anyone, ever, to produce a single Facebook post (at least according to the agency and brand). Other examples of brands that have broken social media records, however contrived, can be found on RecordSetter.com's Social Media World Records subsite.